In a small bowl, combine the butter, lemon juice, zest and the chili paste or sriracha sauce. Using a wooden spoon, press and mix everything together. Lay a 10x10-inch piece of plastic wrap on a flat surface. 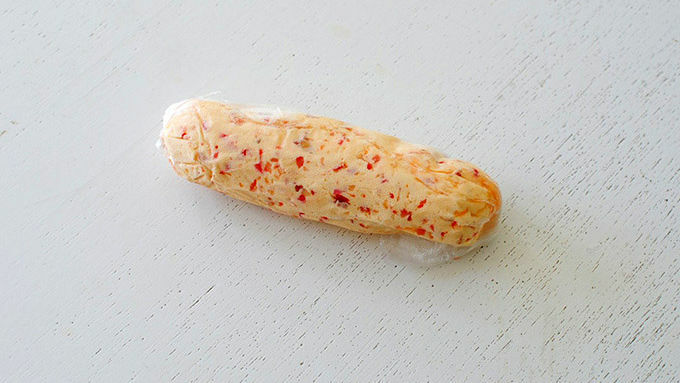 Dollop the butter on the plastic wrap in a log shape. Roll the butter in the plastic wrap, creating a log. Put in the fridge for a few hours or until you're ready to use. 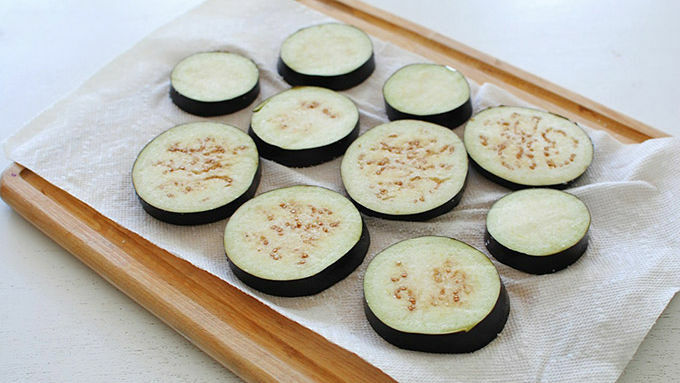 Place your sliced eggplant on a few towels; sprinkle with salt and let sit for 20 minutes, flipping them halfway through. This will help draw out some moisture. Heat a grill (indoor or outdoor) to medium-high. Brush the veggies with oil or butter and grill until tender and nicely charred on all sides, seasoning with salt and pepper. 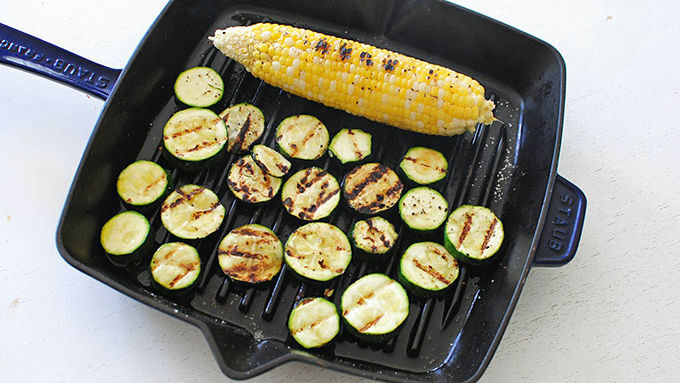 Brush the veggies with the lemon-chili butter as they grill. 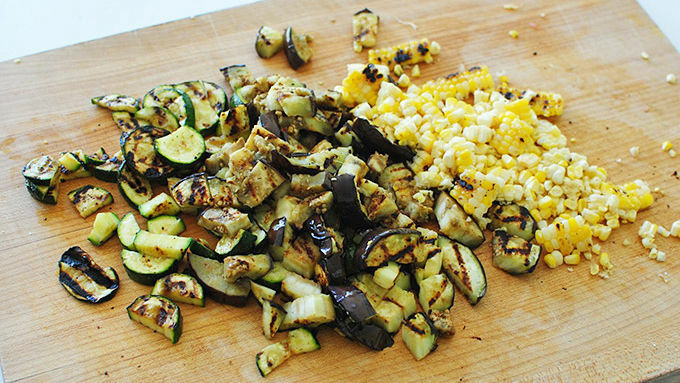 Roughly chop the grilled veggies. Remove the kernels from the ear of corn. In the meantime, boil the pasta until al dente. Drain all but 1/3 cup of the pasta water. In a large bowl, combine the pasta, reserved pasta water, chopped veggies, corn, and 3-4 tablespoons of the lemon-chili butter. Toss to coat everything with the butter. If the pasta needs more butter, keep adding! Otherwise use any leftover butter as you desire. 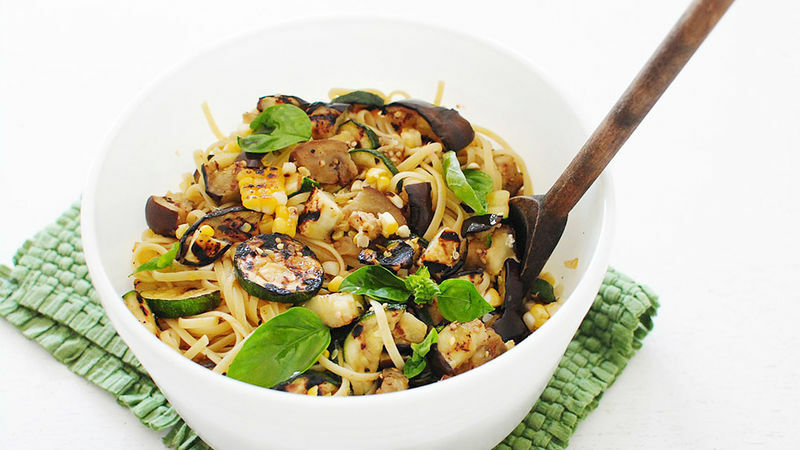 Flavored butter + grilled vegetables + pasta = WE ARE IN. I absolutely love making flavored butters. Not only is it therapeutic to mix all the textures and flavors, but – it's butter. Ding.Dang.Butter. No matter what you do it, it's still going to be butter. And I like it. So this late summer meal not only uses the last of your garden bumper crop, but it's all coated in a slightly spicy, slightly tart, finger lickin' compound butter. Plus, it's a pasta meal, sooo…. You'll boil some linguine, and toss everything together with a few tablespoons of the butter. Garnish with basil and Lordy LOU, you guys. Summer summer summer. I mentioned the butter, right? Slurp.